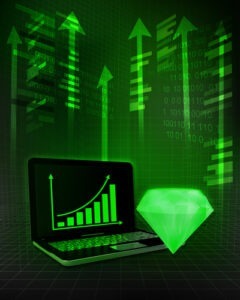 Green diamond with positive online results in business. Photo courtesy of Shutterstock. The Internet has completely changed the way business is done in the modern world. Over the last 20 years, more and more businesses have embraced the world of online marketing in order to tap into the growing market. In 2012, the International Telecommunications Union (ITU) predicted that 2.5 billion people will be using the Internet by 2015, indicating rich opportunities on this platform. According to a study by Nielsen, U.S. e-commerce sales in 2012 accounted for 5.2% of total sales. What’s more U.S. Census Bureau’s statistics indicated that 77% of shoppers are influenced by online recommendations. If you have always harbored a dream of working in a jewelry store then it is time to start looking at opportunities available in an e-Commerce jewelry store. What could be more enjoyable than seeing a satisfied solitaire diamond ring buyer recommending your services? This industry is projected to grow into a $90 billion dollar industry by 2016 according to US Bureau of Statistics. Creativity: With so many e-Commerce jewelry stores already in existence, you have to think outside the box to come up with a successful product. For starters, you have to ensure the web page hosting your store is creatively designed and user-friendly in order to retain more visitors. To stand out you should invest in a web design service as opposed to using free templates. Passion for selling: While a solitaire diamond ring is the dream of every woman you should not expect it to be bought just because you have it on your catalogue. You have to sleep, dream, eat and talk ‘selling’ every time and this will be through online marketing. You have to show some passion to let potential solitaire diamond ring shoppers believe in your product. Be a geek: The word might be used negatively in most circles but if you want to build a career in online marketing you have to let it stick. Every update and development in the internet world should be quickly absorbed and utilized on the e-Commerce jewelry stores. For example, Instagram and Twitter which were non-existent 7 years back are today influential tools in marketing. Be open-minded: One advantage that traditional jewelers have is that they never received constant criticism. However with proliferation of communication tools such as social media, feedback about your service is instant. You must sit back and reflect before rising to the defense of your solitaire diamond ring business. Remember every comment from visitors can strengthen your business. Business suaveness: Your e-Commerce store must make money and hence you have to be not only an administrator but also a financial manager. You must look at all ways of monetizing your business, however small it is. A successful career at an e-Commerce jewelry store rests on how unique your products and services stand. Therefore, your motivation coupled with constant training will help you take your business to another level.